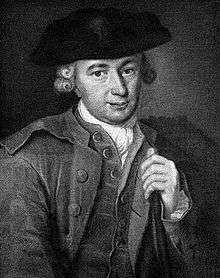 Johann Georg Hamann (German: [ˈhaːman]; 27 August 1730 – 21 June 1788) was a German philosopher, whose work was used by his student J. G. Herder as a main support of the Sturm und Drang movement, and associated by historian of ideas Isaiah Berlin with the Counter-Enlightenment. However, recent scholarship such as that by theologian Oswald Bayer places Hamann into a more nebulous category of theologian and philologist; he views him as less the proto-Romantic that Herder presented, and more a premodern-postmodern thinker who brought the consequences of Lutheran theology to bear upon the burgeoning Enlightenment and especially in reaction to Kant. Goethe and Kierkegaard were among those who considered him to be the finest mind of his time. 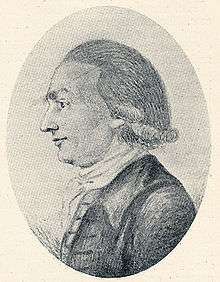 Hamann was born on 27 August 1730 in Königsberg. He was destined for the pulpit, but became a clerk in a mercantile house and afterward held many small public offices, devoting his leisure to intense study. His first publication was a study in political economy about a dispute on nobility and trade. He wrote under the nom de plume of “the Magus of the North” (German: Magus im Norden). His translation of David Hume into German is considered by most scholars as the one that Hamann's friend, Immanuel Kant, had read and referred to as inspiration for awakening from "dogmatic slumber". Hamann and Kant held each other in mutual respect, although Hamann once declined an invitation by Kant to co-write a physics textbook for children. His distrust of autonomous, disembodied reason and the Enlightenment ("I look upon logical proofs the way a well-bred girl looks upon a love letter" was one of his many witticisms) led him to conclude that faith in God was the only solution to the vexing problems of philosophy. His most notable contributions to philosophy were his thoughts on language, which have often been considered as a forerunner to the linguistic turn in postmodern philosophy and also Wittgenstein's philosophy. He famously said that "Reason is language" ("Vernunft ist Sprache"). Hamann was greatly influenced by David Hume. This is most evident in Hamann's conviction that faith and belief, rather than knowledge, determine human actions. Also, Hamann asserted that the efficacy of a concept arises from the habits it reflects rather than any inherent quality it possesses. Hamann famously used the image of Socrates, who often proclaimed to know nothing, in his Socratic Memorabilia, an essay in which Hamann critiques the Enlightenment's dependence on reason. Hamann was one of the precipitating forces for the counter-enlightenment. He was, moreover, a mentor to Herder and an admired influence on Goethe, Jacobi, Hegel, Kierkegaard, Lessing, and Mendelssohn. Hans Urs von Balthasar devoted a chapter to Hamann in his volume, Studies in Theological Styles: Lay Styles (Volume III in the English language translation of The Glory of the Lord series). Most recently, Hamann's influence can be found in the work of the theologians Oswald Bayer, John Milbank, and David Bentley Hart. Hamann's writings consist of small essays. They display two striking tendencies. The first is their brevity, in comparison with works by his contemporaries. The second is their breadth of allusion and delight in extended analogies. For example, his work Golgatha and Scheblimini! By a Preacher in the Wilderness (1784) was directed against Moses Mendelssohn's Jerusalem, or on Religious Might and Judaism (1782). His work was also significantly reactive and reparative: rather than advance a “position” of his own, his principal mode of thinking was to respond to others' work. Hamann was a lutenist, having studied this instrument with Timofey Belogradsky (a student of Sylvius Leopold Weiss), a Ukrainian virtuoso then living in Königsberg. Fragments of his writings were published by Cramer, under the title of Sibyllinische Blätter des Magus aus Norden (1819), and a complete edition by Roth (7 vols., 1821–25, with a volume of additions and explanations by Wiener, 1843). Hamann's des Magus in Norden Leben und Schriften, edited by Gildemeister, was published in 5 vols., 1857–68, and a new edition of his Schriften und Briefen, edited by Petri, in 4 vols., 1872-74. ↑ W. M. Alexander, Johann Georg Hamann Philosophy and Faith, Springer, 2012 : "Hamann left the University in 1751 or as late as 1752 without taking a degree." 1 2 Johann Georg Hamann, Brief an Herder, v. 8. August 1784, in: Johann Georg Hamann, Briefwechsel, 7 vols., Arthur Henkel (ed. ), Wiesbaden: Insel Verlag, 1955–75, vol. 5, p. 177. ↑ O'Flaherty 1979, p. 19. ↑ Garrett Green, Theology, Hermeneutics, and Imagination: The Crisis of Interpretation at the End of Modernity, Cambridge University Press, 2000, p. 53. ↑ Bayer, Oswald. A Contemporary in Dissent: Johann Georg Hamann as a Radical Enlightener. Roy A. Harrisville & Mark C. Mattes, trans. Grand Rapids: Eerdmans, 2010. ↑ Christoph Meineke: „Die Vortheile unserer Vereinigung“: Hamanns Dangeuil-Beylage im Lichte der Debatte um den handeltreibenden Adel. [In German] In: Beetz, Manfred / Rudolph, Andre (Ed.). Johann Georg Hamann: Religion und Gesellschaft (2012), pp. 46–64. Forster, Michael N., After Herder: Philosophy of Language in the German Tradition, Oxford University Press, 2010, ch. 8–9. David Bentley Hart, "The Laughter of the Philosophers", First Things. January 2005. This article incorporates text from a publication now in the public domain: Ripley, George; Dana, Charles A., eds. (1879). "Hamann, Johann Georg". The American Cyclopædia. Alexander, W. M. (1966). Johann Georg Hamann: Philosophy and Faith. The Hague: Martinus Nijhoff. Smith, Ronald Gregor (1960). J.G. Hamann 1730-1788: A Study in Christian Existence. New York: Harper & Brothers. "Johann Georg Hamann". Stanford Encyclopedia of Philosophy. Hamann, Nietzsche, and Wittgenstein on the Language of Philosophers - open access post-print version of chapter from Hamann and the Tradition (Illinois: Northwestern University Press, 2012), p. 104-121.
International Bibliography of works by and on Hamann, on Éditions Ionas website.